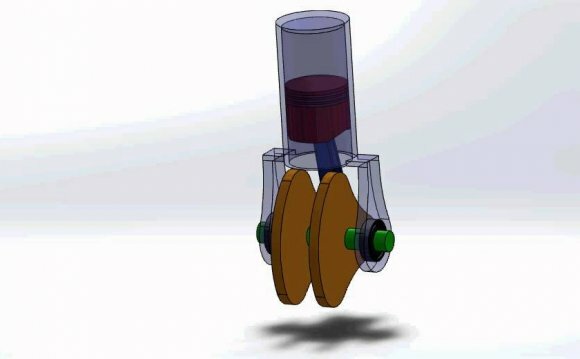 This type of Stirling engine, known as the beta configuration, features just one cylinder with a hot end and a cool end. The working gas is transferred from one end of the cylinder to the other by a device called a displacer (illustrated in blue). The displacer resembles a large piston, except that it has a smaller diameter than the cylinder, thus its motion does not change the volume of gas in the cylinder—it merely transfers the gas around within the cylinder. Most of the gas in the system has just been driven to the hot end of the cylinder. The gas heats and expands, driving the piston outward. The gas has expanded. Most of the gas is still located in the hot end of the cylinder. Flywheel momentum carries the crankshaft the next quarter turn. The bulk of the gas is transferred around the displacer to the cool end of the cylinder. The majority of the expanded gas has shifted to the cool end. The gas cools and contracts, drawing the piston inward. The contracted gas is still located near the cool end of the cylinder. Flywheel momentum carries the crank another quarter turn, moving the displacer and transferring the bulk of the gas back to the hot end of the cylinder.